We’re so proud! Three of our model homes were recognized by the Northeast Florida Builders Association at the 2015 Parade of Homes banquet. The winning model homes were The 3110 Model Home in Yellow Bluff Landing, The Fanning Model Home in Village Center at Durbin Crossing, and The Juniper Model Home in Greenleaf Lakes at Nocatee. The 3110 Model Home at 16 Hunters Hollow Court in Yellow Bluff Landing is a beautiful two-story home that offers 3,519 sq. ft. of living space, four spacious bedrooms, three-and-a-half baths, a formal dining room, study, a first floor game room, an oversized loft, and a gourmet kitchen and café that are ideal for entertaining. Life can be beautifully inexpensive in this energy-efficient ENERGY STAR® Certified Home with a HERS Rating of 60, and estimated $165 per month electric bill. The Fanning Model Home at 36 Eagles Nest Lane in Village Center at Durbin Crossing features 2,381sq. ft. of living space, with three bedrooms, three-and-a-half baths, a study, family & dining rooms, a kitchen/café and loft. The foyer and dining room are open to the kitchen/café, family room and lanai for easy entertaining. The expanded owners suite is a must see. This 100% ENERGY STAR® Certified Home features open cell spray foam insulation under the roof deck for years of consistent comfort, superior energy savings and a greener insulation alternative. The Fanning received a 5-Star + HERS Rating of 58 with estimated $117 per month electric bill rating! The Juniper Model Home is located at 144 Maiden Terrace in Greenleaf Lakes at Nocatee. It is a spacious two-story home, with three bedroom, two-and-a-half baths, and 2,524 sq. ft. of living space. This 100% ENERGY STAR® Certified model home features a living room, dining room, family room, and gourmet kitchen/café with bay window, covered patio and 2-car garage. Wait until you see the upstairs loft and extended owners suite! The Juniper received a 5-Star + HERS Index Rating of 50 with an estimated $99.25 per month electric bill rating! 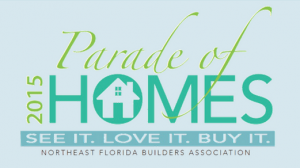 The 2015 Northeast Florida Builders Association Parade of Homes was one of the largest ever, with more than 100 model home entries throughout Northeast Florida. All three winning model homes are open daily Monday-Thursday & Saturday from 10AM-6PM and Friday & Sunday from 12-6PM. Call 904-337-5236 for details or additional information.